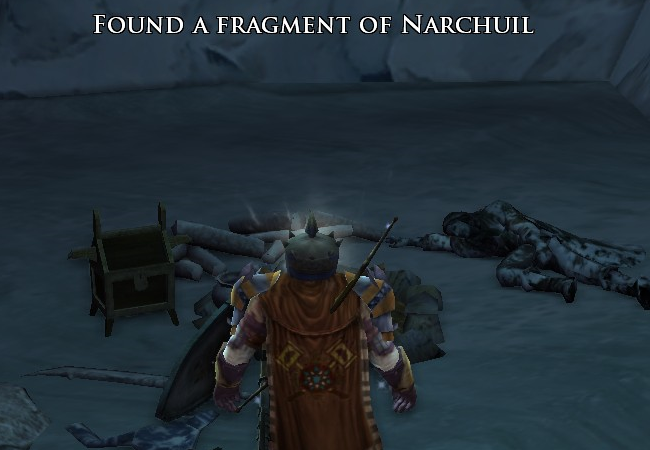 At the end of Volume I Book XII the cut scene intoned that the other half of the ring Narchuil, the current focus of the epic quest line, was somewhere in Forochel. 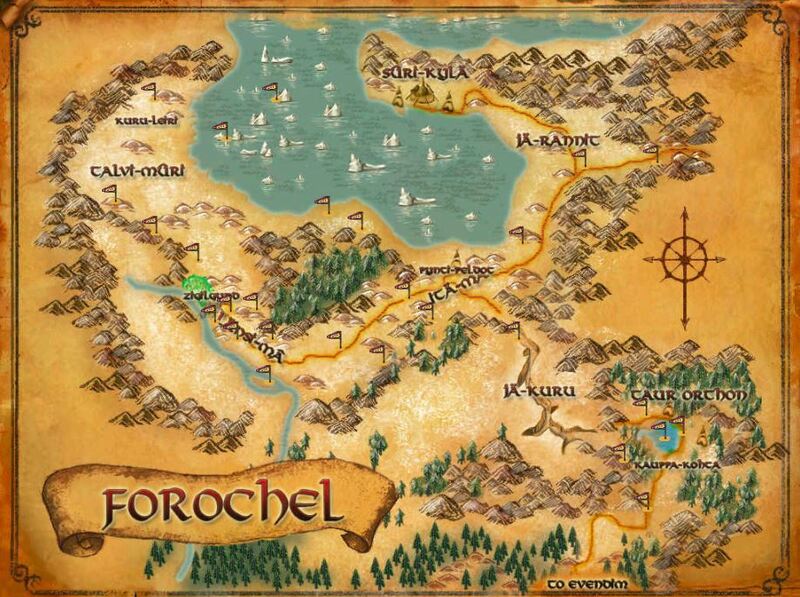 While I have been to Forochel before and have run a lot of the quests there, that was quite a while ago. Like, back in 2011. But I have a screen shot to prove I was there. What I had forgotten was how big the zone is. And the maps in the game do not really convey size very well, as they are all the same size in the game and do not have a scale listed. Seriously, Forochel is a deceptively large piece of real estate relative to other zones. I rode into Forochel from Evendim, which was not that long of a ride. Book XIII, chapter 2 sends you to the first Lossoth encampment, Kauppa-kohta. There you check in, only to be sent on to Suri-kyla, the capital of the Lossoth people, to speak to the chieftain. I could ride on my own or pop a mithril coin for the stable master to get me to the next stop. Having a pile of mithril coins still, I opted to just ride, heading to the next stable master down the road and… that took a while. Kauppa-kohta to Pynti-peldot took nearly five and a half minutes, stable master to stable master. Pynti-peldot to Suri-kyla, my actual destination, was a further five minute ride, stable master to stable master. To put that into perspective, going from the Foresaken Inn to Ost Guruth in the Lone Lands takes three and a third minutes. I would estimate that is about 75% of the length of the zone, so the whole of the Lone Lands end to end ought to be about a four and a half minute ride. So the distance between stops in Forochel are pretty much the length of the Lone Lands. You could basically fit the Lone Lands in between Kauppa-kohta to Pynti-peldot. Yes, the rides are not exactly as the crow flies, but then the road through the Lone Lands does a bit of twisting at the end as well. And then where you need to go eventually is Kuru-leiri, which is way around on the other side of the bay… and you can’t just go all Evendim and swim there because the frozen water will defeat you… another case where defeat stands in for death… which means you need to make another ride back to Pynti-peldot and then a further ride to Zigilgund, something that closes in on ten minutes of riding again, and which still leaves you a fair walk from your destination. Anyway, now that I have beaten that to death, suffice to say that I spent more time traveling back and forth than I would have preferred. I’ll just sum it up in map form. This, of course, points out a problem I always have. While the game is trying to tell me this epic tale, a series of background tasks that helped make the victory over Sauron possible, I am always more interested in my own story, the odd situations, and the petty inconveniences I have to face along the way, and riding all over Forochel makes that list. Seriously, I try to imagine the books written to conform to how some of these quest chains run. What if the fellowship of the ring had to run back to Rivendell and consult with Elrond every third event. 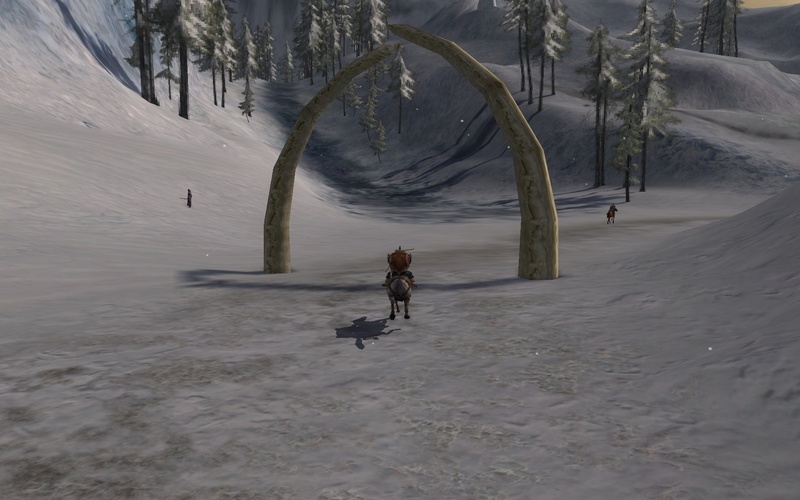 Oh, the Redhorn Gate is snowed in, better ask Elrond. Damn, the door to Moria is locked, better ask Elrond. Hrmm, Gandalf is dead, everybody back to Rivendell for a consult. But there I was in the snow, looking for the other half of the lesser ring Narchuil and hoping not to have to report back to Rivendell any time soon. With the revelation that the remaining bit of the ring was in Forochel the usual cast of characters seemed destined to follow on. 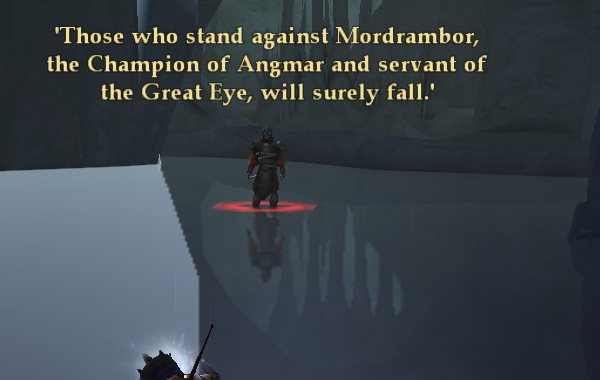 First on the scene was Mordrambor, agent of Angmar, and special guest star in the epic quest line since Book X and the running about in Evendim. He showed up to throw his weight around in the usual way. Given that my fate so far has been that of glorified messenger between various NPCs, the locals ought to be wary of sharing it. After doing various tasks to gain the favor and trust of the Lossoth eventually Saija consented to lead me to the missing ring. This is another instance that was supposed to be fellowship only, but which you get the now usual buff in order to handle it solo. 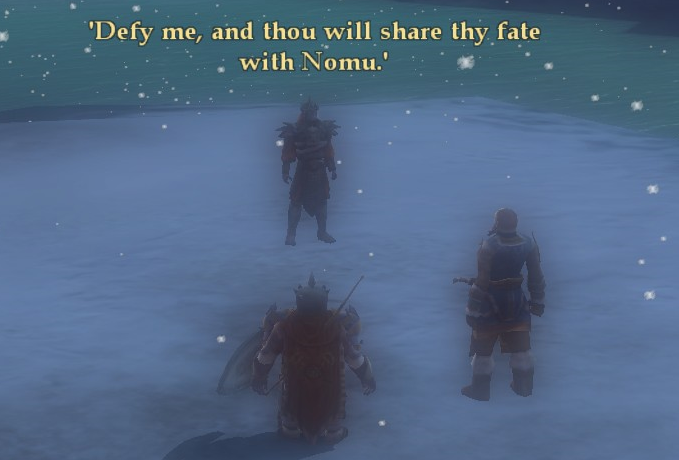 And the end of the instance Mordrambor shows up, because of course he does, and Saija opts out on fighting him, so I am there to face him alone. But first, of course, we have to have the monologue about the futility of my task. This is your elevator pitch, isn’t it? Then we fight. 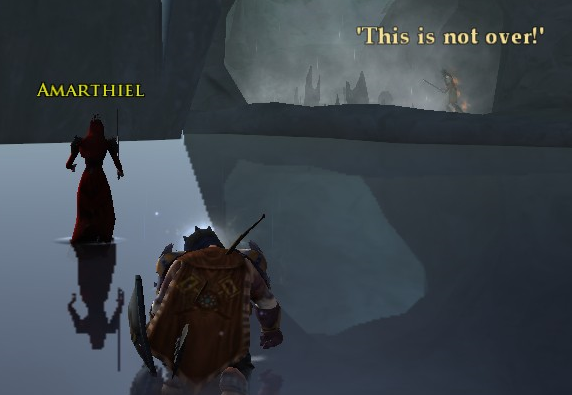 With all the buffs and a decent rotation I am wearing him down, when suddenly Amarthiel appears, stuns me, and squares off against Mordrambor. How many ways into this place are there? Did we have to take the long way? At this point my failure to pay close attention to the story starts to show, since I am a bit hazy on why these two are fighting again. I get it, they both want the ring. But don’t they essentially play for the same team? I mean, Mordrambor is there declaring himself a servant to the Great Eye and Amarthiel was just on the palantir to Mordor to speak to his Eyeness not so far back in the tale. I guess this is more of an office politics thing on the dark side. Mordrambor, for all his talk, isn’t keen to stick around, though he leaves on an implied promise of a return visit. You’ve not seen the last of me! Amarthiel also departed, leaving me alive and/or undefeated this time. Why? I don’t know. But there I am and there is an ancient chest to hand… because nobody every stores things in a recently built chest. Fragment? What does that mean? At that point I was done with the instance and, as far as the epic quest line was concerned, done with Forochel for the moment. The next step was, as expected, a run back to Rivendell to consult with Elrond. I didn’t jump right on that however. Elrond is a patient man… elf… half elf I guess. I had done enough to get pretty well along with my reputation with the locals. This was a bit of a surprise since you start with a factional deficit. However, the mobs in the zone drop lots of trinkets that, when consumed, raise your reputation, so I was able to get the Lossoth to kindred without a ton of effort. I was a bit disappointed that their mount wasn’t a moose or something, but I’ll take a tundra pony in a pinch. That done, I headed back to Rivendell to tell my tale. There I learned that “fragment” meant “the other half” and that basically all of Narchuil had been secured. Laerdan was all giddy to get on the road to Erigon, where the rings were forged during the second age of Middle-earth, and get to work putting Narchuil back together. And so it seemed that I might be headed to Eregion at last, the final zone in the pre-Moria content. This entry was posted in entertainment, Lord of the Rings Online and tagged Forochel, LOTRO Legendary, Mordrambor, Narchuil on January 23, 2019 by Wilhelm Arcturus.